Let's be honest...it's not always easy to make healthy eating choices at this time of year. What, with Christmas mince pies, Quality Streets, year-end functions and Christmas parties...sweet treats seem to abound at Christmas and New Year. And, of course it is great to enjoy some of these treats. But, it's also important to keep a good basis of nutritious food coming into your system, in the form of healthy meals and snacks. If most of your meals and snacks remain healthy, then it allows room for you to enjoy some extra treats. 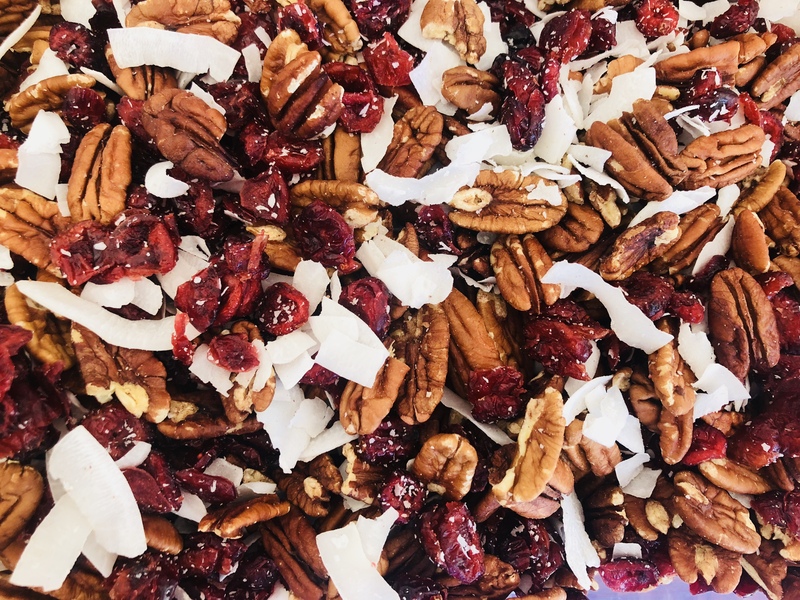 This trail mix recipe is meant to be used as one of your healthy snacks...well, its kind of like a 'treat-snack' because it is just so yummy! It can also be kept in a container or zip-lock bag as what I call an 'emergency snack'...you know the story...you're stuck at the mall doing last minute Christmas shopping, its crazy busy, its 2pm, you haven't had lunch, you're stuck in a horribly long queue at Pick 'n Pay, someone just bashed their trolley into your ankles, there is a kid having a tantrum, and you're getting HANGRY (Hangry = Hungry + Angry!). No need to fear, dear friend...whip out this trail mix, have a munch on it, and all will be well in the world again. It is also great to grab a handful of this trail mix as you rush out the door on the way to a braai with friends. Because, we all know what happens when you arrive at a braai hungry...you end up eating like 1kg of chips while you wait for the braai to be ready. Not the best situation to find yourself in. If you munch on this magical Christmas mix before leaving home, you'll find the chips much easier to resist, or at least it will be easier to stop after one handful. This trail mix is also great to use as a gift. Put it in a glass jar, tie a pretty bow around it, and there you go, and awesome Christmas gift or year-end thank you gift for teachers. I also love that this trail mix looks so pretty and Christmasy. Its important that the food that you eat is visually appealing to you. And, that's exactly what this is. That's it friends! Easy, peasy! Its nice to store it in a glass jar. It will stay fresher for longer if you keep it in the fridge. Then...a secret extra addition to this to turn it into a 'treat' rather than a 'snack'...Add some dark chocolate chips to the mix...heavenly.